Powers/Abilities: Next to the shapeshifting abilities common among Skrulls, each K-Class Skrullian possessed his or her own mutant powers. Traits: Since the Mutant Skrulls are much younger and have been tortured and killed by the general Skrull population they might be less aggressive. (Maximum Security: Dangerous Planet#1 (fb)) - The Skrull Empire regulated child birth by using multiple creche-worlds. On these planets, Skrull would hatch from eggs during the hatching cycle. Hatch wardens would then scan the newborn Skrulls to check for any genetic impurities. X-gene positive Skrullian infants, called K-Class Skrulls, were deemed unworthy to life and got terminated on the spot. (X-Men II#95 (fb) - BTS) - After the destruction of their Throneworld, a faction of the Skrull people allied themselves with the powerful terran mutant Apocalypse, hoping this would help them in rebuilding their own powerbase. In exchang for his aid, they would help Apocalypse gather and utilize "the Twelve". (X-Men II#95 (fb) - BTS) - After the X-Men discovered Wolverine had been replaced by a Skrull, the chief scientist Granok was ordered to produce another infiltrator agent and this time make sure the agent did have healing powers. Creating one with actual mutant powers proved somewhat difficult since most Skrulls can only mimic appearances and not powers, save for the Warskrulls whose genetic strain had died out. Granok jumped at the chance to recreate the lost Warskrull gene. To achieve this, he halted the normal at-birth culling of K-Class Skrull mutants in order to use them as experimental subjects. He had a contingent of young K-Class Skrulls brought to Earth for experimentation. Though these experiments would often be painful and even lethal, the K-Class were ensured they were in fact special and that it was an honor to serve. (X-Men II#95) - A contingent of K-Class Skrulls, including Fiz and Jaq, were brought to Earth for Granok to continue his genetic experiments on. Fiz and Jaq watched how Granok's latest attempt at creating a copy of Wolverine fought and beat a batallion of Skrulls. In the aftermath, Granok proudly presented his subject to the military commander who shot "Wolverine" through the head to point out any infiltrator without a mutant healing factor still wasn't convincing. Watching this scene made Fiz fear that Granok would soon be exposing another one of them to his experiments, while the far more obedient Jaq felt it would be an honor to sacrifice his life for his race. 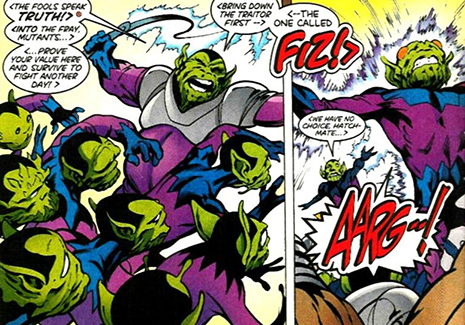 Fiz however had trouble with the mission, because he had heard stories of the X-Men actually trying to help the Skrulls during Galactus' assault on Throneworld. Furthermore, he wondered why Apocalypse didn't help them back then. Jaq would hear nothing of this and told Fiz to shut his mouth. Some time later, when the X-Men attacked the Skrulls' headquarters, the K-Class holding pen was accidentally breached. Some of the loyal K-Classers decided to help fight the X-Men, while Fiz figured such blind obedience would only lead to a certain grave. He took it on himself to find a better way to help his people and even find a new home and hid aboard the X-Men's plane. (Uncanny X-Men I#376) - Fiz was quickly discovered by Xavier's telepathic powers as soon as the X-Men returned home. The scared young K-Class Skrull managed to elude the mutants for a while using his size changing powers, but was eventually caught. Kitty Pryde, who spoke fluent Skrull, was able to understand Fiz who told her all he wanted to do was serve "The Xavier", help him in mastering his powers and even expressed interest in joining the team. As soon as the others could understand Fiz, courtesy of a Shi'ar universal translator, he told the X-Men all he knew of the Skrulls' mission and the Gathering of the Twelve. (X-Men II#96) - Fiz was seen in the Danger Room, working with Rogue and Kitty Pryde who were setting up machinery to test his strength levels. Storm and Cyclops looked on from the control booth, with Scott admitting to Ororo that he simply didn't trust their young Skrull guest yet. Some time later the Horseman Death (actually a mind-controlled Wolverine) invaded the mansion to collect Mikhail Rasputin who was one of Apocalypse's Twelve. The X-Men fought Death, with Fiz joining in after the Horseman beat back Rogue. Despite a valiant effort, Fiz was pummeled by Death and tossed aside. However, he saved all the X-Men with his size-changing powers after Death caused a wall to fall down on them in order to make his escape. A little while later, after determining Apocalypse was in Egypt, Fiz was allowed to accompany the X-Men. (Uncanny X-Men I#377) - Fiz stood with the X-Men and their ally Magneto in Egypt when Apocalypse sent his Horsemen, the Cult of the Living Pharaoh and a contingent of Skrull soldiers against them. The fight was a ruse to collect the final, missing members of the Twelve which included Xavier, Magneto, Storm, Cyclops, Jean Grey, Polaris and Bishop who was pulled through time to the scene of the battle. Fiz and the others couldn't prevent any of the kidnappings. After Apocalypse had the Twelve assembled, he ordered his troops to kill their enemies. (X-Men II#97) - The Skrulls sent in the K-Class mutants to fight on their behalf. They were told to first bring down the traitor Fiz. The size-changer was shot in the back with an electrical blast and then pounded on by his fellow K-Classers. The beating continued until Fiz was rescued by Beast. The battle continued and eventually overwhelmed the young telepath Z'Cann who tried to flee from the battlefield, only to face the military commander who was about to whip her for trying to run. Fiz was on hand to knock him out. He then persuaded Z'Cann to use her telepathy on him to make the other K-Class Skrulls see and experience all the things he learned during his time with "The Xavier". 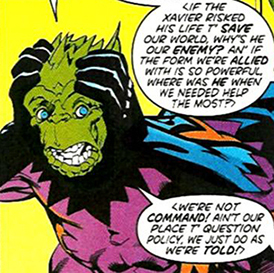 This was enough for the Skrullian mutants to switch sides and openly aide the X-Men, which allowed the team to leave the battle and enter Apocalypse's pyramid. (Uncanny X-Men I#378 ~ X-Men II#98 ~ X-Men Unlimited I#26) - The K-Class Skrulls were all present when the Cyclops/Apocalypse hybrid briefly altered reality several times to fool the Twelve into expending their powers to help strengthen him. They played no part in all the alternate planes of existence, but did bear witness to the aftermath when a heartbroken Jean Grey learned that her husband had apparently perished. (Uncanny X-Men I#379) - Feeling responsible for the fate of the young mutant Skrulls, Charles Xavier decided to join them on a trip into outer space to help train them and make sure they found a place to call their own. Upon departing Earth aboard a Skrull spacecraft, he was given a Shi'ar holo-empathic crystal that contained the essences of all the different mutants he'd helped back on Earth. With all the K-Class Skrulls already on board, the professor said goodbye to Colossus and Kitty Pryde who had come to see them off. When Colossus asked Charles why he had to go, Xavier simply said the Skrulls' need was greater and left. (Maximum Security: Dangerous Planet#1 (fb) ) - Out of all the rescued K-Class mutants, Charles Xavier selected Fiz, Z'Cann, Nuro, R'tee, Goroth and Spunje to form Cadre K, a strike force under his command that would raid Skrull creche-worlds and rescue mutant Skrull infants from being exterminated. They struck on six different worlds, including Carpiax-IV. After defeating any and all opposition, Cadre K would take the infants to safety to a hidden colony somewhere in Skrull space. Comments: Created by Alan Davis (writer), Tom Raney (pencils), Scott Hanna (inks). This profile only describes the events concerning the K-Class Deviant Skrulls as a sub-race, for specific information on the Cadre K and their individual members you'll have to wait for their profiles, they'll go online soon. The fact mutant Skrulls are even born is a bit of a mystery since Uncanny X-Men Annual#11 established that the Skrull race was genetically frozen in place, never again to evolve another step. The Skrull race was one of many races who failed a test in the Citadel of Light and Shadow where species could obtain a reality-altering crystal, to pass the test the person had to refuse to use it. The Skrull who made the attempt was transformed into a statue outside the Citadel. On the other hand, the case could be made that the Skrulls won't evolve beyond producing mutants. Profile by MarvellousLuke & Norvo. Jaq was a K-Class Skrull who was brought to Earth by the Skrulls serving Apocalypse to be used in their plans. While other K-Class Skrullians like Fiz were hesitant to follow their master's orders, Jaq was all too willing to follow their rule and felt honored to serve. He refused to listen to Fiz's stories about the X-Men having come to the Skrulls' aid when Galactus consumed Throneworld. He later willingly attacked the X-Men when they entered the Skrulls' base looking for Polaris. Jaq presumably perished along with the rest of his garisson when the Skrull base exploded.